EDIT 6/28: A 6 regular ended up being the best fit for me because the fabric doesn't have much stretch. I ended up buying this dress at a particularly good sale price. As a tangent, headless fitting room mirror selfies are probably the primary type of photographs of myself that I will take for the blog (potentially to be replaced by self-timer digital camera "selfies" if I ever get the hang of it). 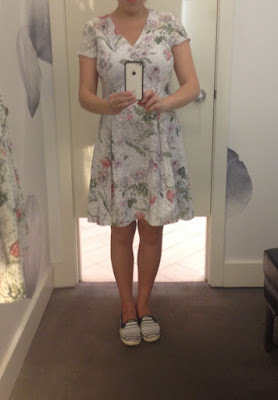 I'm still learning how to take a flattering-ish (but still helpful) photograph of clothing too, so the above pictures might just illustrate the big differences that things like the angle at which I hold my phone, how I place my arms, or how far I stand from the mirror, can make on even a fitting room selfie. One dress also fits a lot better because of the limited sizes available in store, which makes the petite versus regular size comparison illustrated above even less useful. Today, while returning the shirtdress, I tried on the Ann Taylor Floral Eyelet Dress, which Franish and another blogger have posted. I really like it and am sorely tempted to buy it, but with a few caveats. The outer part of the dress is cotton, but the lining contains polyester, which means that its fairly unsuitable for casual wear, particularly on my upcoming vacation to hot, humid climes. It's currently an additional 30% off sale, for a total of $90.99 before tax/shipping, which is a bit high when I really don't need another work dress, especially one that would be uncomfortable on an NYC summer commute. I'm wearing an 8 petite on the left, which fits well but is too short (well above the knee, more than an inch) and a little bit too "mini dress" (the waist is a bit high for my tastes) for me. The model photo suggests that the dress is actually supposed to be that length, but I'd want it for work more than play. They only had the 8 regular, pictured on the right, and it is definitely as much as two sizes too big. If I am indeed a 4 or 6 regular, that would make this fairly true to size for Ann Taylor. My photos totally don't show the regular-sized dress to its best advantage and maybe deemphasize the length of the petite one. Looking at my photos now even makes me think that I should order the petite to try on again though I was so sure it was too short in the store... In this case though, I'm pretty sure the camera misleads and the regular in a smaller size will be the one for me if I try it out again.